An injury to star quarterback Aaron Rodgers crippled the Green Bay Packers’ 2017-18 season, as backup Brett Hundley simply couldn’t do enough to lead the team to the postseason with Rodgers on the shelf. However, it’s unfair to rest the entirety of Green Bay’s woes this past season on the quarterback position, as Hundley/Rodgers didn’t quite have an award-winning supporting cast on either side of the ball. Packers wide receiver Jordy Nelson put together one of the worst statistical seasons of his career, and lack of production at both running back and tight end didn’t fill the void. Similarly, Green Bay’s front seven, specifically their edge talent, failed to create pressure on the quarterback at a consistent rate, leading to poor pass defense across the board. For as long as Rodgers is healthy and under center, the Packers will be contenders for the big dance, but the 34-year-old gunslinger will need at least some help around him to pull off a deep playoff run. At 29 years old, Burnett is undoubtedly nearing the end of his NFL career, but his ability to remain consistent, especially against the run, should keep him in Green Bay. Playing near the line of scrimmage, Burnett is a difference-maker when healthy, as he earned the top run-defense grade among safeties in both his 2014 and 2015 season. He also led all qualifying safeties in tackling efficiency (27.5) a year ago, missing just two tackles across 500-plus defensive snaps. Of course, Burnett’s sure tackling in 2017 shouldn’t come as a surprise, as he has missed just 62 of his 764 tackle attempts for a career tackling efficiency mark of 12.3. Butler’s head-scratching fallout with the New England Patriots will have all interested GMs doing their due diligence this offseason, but if Green Bay’s front office feels comfortable with whatever happened, they’d be smart to add Butler’s on-field talents to their repertoire. The five-year West Alabama product had a bit of down season following his career year in 2016, as his overall grade dropped from 88.1 to 79.2 in 2017. However, Butler still stands out as one of the better man-coverage cornerbacks in the NFL with his ability to remain aggressive and make plays on the ball. He can let his aggression get the best of him and will be the victim on some big plays, but his baseline play is still among the best and is worlds better than the Packers’ current slew of cornerbacks. Green Bay’s Davon House, who is also a free agent, earned a 50.4 overall grade as the team’s No. 2 cornerback behind Damarious Randall, while the team’s two more inexperienced cornerbacks Josh Hawkins (25) and Kevin King (22) both earned sub-45.0 overall grades. The Butler sweepstakes won’t be without its fair share of suitors, which could push Green Bay and their shallow pockets towards a less-coveted veteran cornerback in Rashaan Melvin. Melvin earned a career-high 85.7 overall grade with the Indianapolis Colts in 2017. He also ranked 12th in passer rating allowed (60.3) and 20th in run-stop percentage (3.0) among qualifying cornerbacks this past season. Given his slow start in the NFL, Melvin is expected to sign a short-term, incentive-laden deal, as teams will need to see that he’s much more than a one-year wonder before he inks a long-term contract. 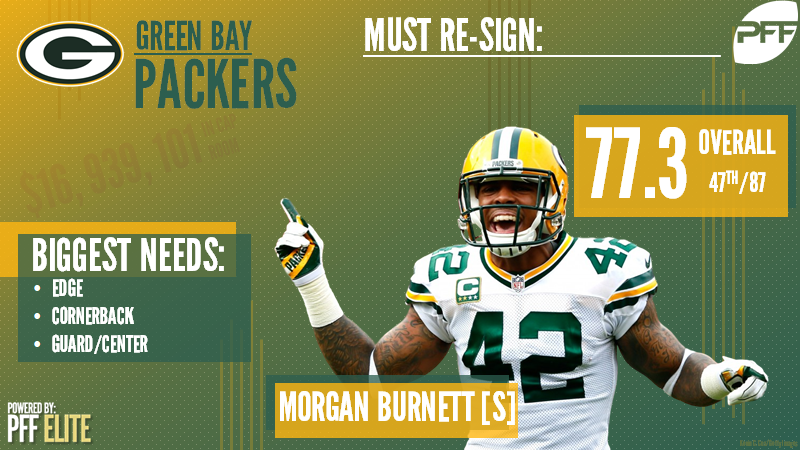 As such, the Packers could benefit from throwing their hand in the ring as a low-risk, high-reward investment. Turning 32 next season, Graham’s days of being an every-down game-changer at the tight end position may be behind him, but his 6-foot-7 frame and ball skills still create for a high-end red-zone target in this league. Though only nine of his 57 catches were thrown 10-plus yards down the field, Graham’s work inside the 20-yard line paid dividends for Russell Wilson and the Seattle Seahawks’ offense. Also, Graham still is versatile enough to line up at either in-line tight end or slot receiver, as he ranked 10th in slot receptions (18) and 11th slot yards (218) among qualifying tight ends in 2017. In Green Bay, veteran tight end Richard Rodgers will be a free agent this offseason, and backup Lance Kendricks has struggled to produce at a high level over the course of the last three seasons.